In 2005 Judy Webb closed down the private girls' school her family had run in the English countryside for nearly 60 years. As she packed away a stack of unused school uniforms, she had no idea that a decade later they would be worn by a class of Kenyan children in a new school, named after hers, in one of the poorest parts of Nairobi. The story of the two schools begins in November 2013 when the BBC World Service launched its first list of 100 inspiring and influential women around the world. As the first female commander of an all-male field force unit in the British army, Judy Webb was one of the women on the list. On top of her trail-blazing military career, she had spent nearly 20 years running Rossholme Girls' School in southern England, before turning it into a thriving country guest house business. The BBC invited all the 100 Women of 2013 to a conference in London, which is where Judy met another name on the list - a Kenyan student called Joyce Aruga. Although they were from different generations, different countries and with very different life experiences, the two women hit it off immediately. 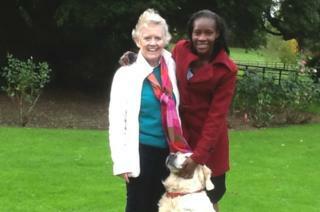 "She was resilient, positive and cheerful," Judy remembers "and she was a very good observer". Joyce, who was 27 at the time, had a back story quite as remarkable as Judy's. The youngest of 11 children, she was born into a poor family on the remote Mageta Island in Lake Victoria in 1986 - the same year Judy Webb took over running Rossholme School. "None of my elder brothers and sisters got an education," she says. "My parents couldn't afford to pay the school fees." At the age of 14 she was forced to become the third wife of a much older man, but - determined to get an education - she ran away from her husband. With the help of a children's charity she got a place at secondary school, and funded her studies working as a maid. By the time Joyce and Judy met in London, Joyce was one year into a teacher training degree at the Kenyan Methodist University in Nairobi - helped by a sponsor from a church in the United States. "I couldn't believe that I, Joyce a village girl, was going to get on a plane and go to London," she remembers. "I had only seen [planes] in drawings. How will I board this thing that flies in the air?" After the conference Joyce spent the weekend in Somerset with Judy and her family. She told them about her dream of one day setting up her own school in Kenya. Judy asked Joyce if she could make use of the uniforms left over from Rossholme school. "She tried one on herself," Judy remembers. "She liked it so much wanted to wear it on the flight home!" For the next three years the two women kept in touch by email, and in July Joyce wrote to say that not only had she successfully graduated with a teaching degree, but she had also opened up a small day-school in Mathere, a vast slum on the edge of Nairobi. Another email followed showing a tiny group of tiny children, all proudly wearing Judy's blue and yellow school uniforms, and standing in front of the blue painted gates of their new school - the Rossholme Education Centre. Joyce is starting small, with 10 pupils aged from 8 months to four years old. "I found them by walking door to door, looking for kids who should have been in pre-school," she says. "When I asked their parents why they weren't in school, they said they couldn't afford the fees." Joyce has been teaching her first class for free, but she's fundraising to expand, and hopes to be able to provide primary and secondary education for up to 100 disadvantaged children over the next two years. "Because of the hardship I went through in life, I made a promise to myself that I would always help the poor and vulnerable," says Joyce. "I try to give some hope to those who have lost it." Joyce says that taking part in the BBC's 100 Women series helped her expand her horizons. "I learned there are challenges everywhere," she says. "It doesn't matter what we have gone through, we can still stand up and fight for our rights." Back in Somerset, Judy has also started fundraising, hoping people who remember Rossholme Girls School, will be inspired to support the new Rossholme Education Centre in Nairobi.